In honor of National Letter Writing Month, we’re putting the spotlight on the beauty of a handwritten letter. When you take the time to craft a handwritten letter, the recipient feels special and loved, something that royal bride-to-be Meghan Markle agrees with. As you might have read in a recent People magazine article, Markle was once part of the Paper Source family, working as a calligrapher at our Beverly Hills location from 2004-2005. Markle’s love for a nice handwritten letter, and her impeccable penmanship, made her a perfect fit for the job. Can you imagine taking a workshop class with a future royal? 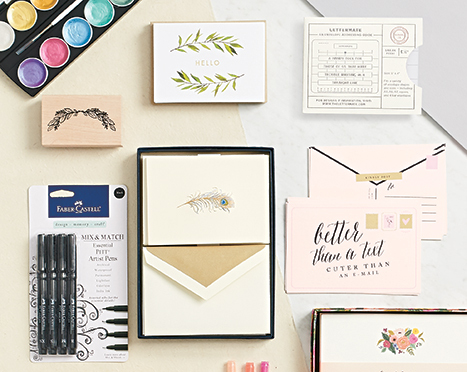 If you want to get an idea of how Markle may have added her own sparkle to handwritten letters, check out our roundup of hand lettering, calligraphy and letter writing essentials. Don’t forget the paper! You’ll need something extra luxe to write on. Check out our beautiful collection of stationery sets. Just in time for you to try out your new pens, we’re hosting a Creative Hand Lettering Workshop on April 12th. Check out our Workshops page or your local store for more details! Keep your hand relaxed – sometimes it helps to shake out the tension before you start lettering. Play around with different pens to find your favorite that you are comfortable writing with. A simple trick to making your everyday cursive look like calligraphy – make your up-strokes thin and your down-strokes thick. And if you’re still feeling a little overwhelmed, heed the advice of Markle and take a deep breath and relax.